The GEEGST strings are the perfect match for electric guitars. They produce brilliant sound with excelent balance and feature a hexagonal/cylindrical tinned steel core for extra long life. Giannini began building guitars in Brazil in 1900 and is currently one of the largest guitar manufacturers in the world. Production of instrument strings started in 1940 and Giannini is now one of the largest string manufacturers, producing millions of sets of strings each year. These strings have been developed and designed with precision technology ensuring high-fidelity sound, precision tuning and long-lasting durability. Manufactured in Brazil utilizing the most modern equipment, Giannini was the first string manufacturer in Latin America to be certified ISO9001 for quality management and construction. 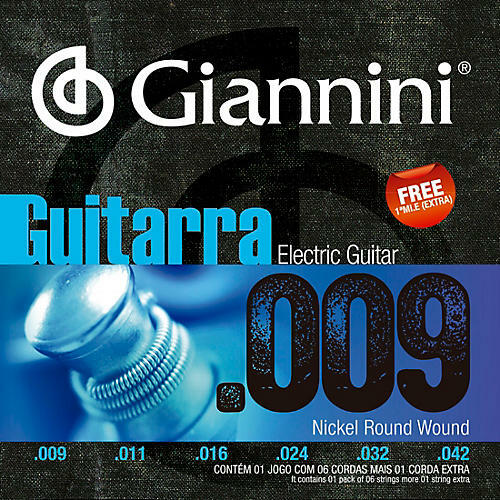 Giannini strings are available for acoustic and electric guitars, classical guitars, acoustic and electric basses, violins and violas, mandolins, cavaquinhos and 10-string Brazilian violas. All sets are sealed in an Anti-Corrosive protective enclosure to ensure maximum performance. Giannini products pass through a strict process of quality control and leave the factory fully imbued with the reliability, craftsmanship, and ultimate care that has been the hallmark of the Giannini name since 1900.